Known for game day-stealing marketing campaigns and clever cross-platform advertising, alcohol brands are key content creators on social media. But while these brands appear to have no trouble giving people something to talk about, they face tough regulatory challenges when it comes to alcohol marketing and engagement. Digital marketing communications are intended for adults of legal purchase age. Digital marketing communications should be placed only in media where at least 71.6 percent of the audiences is of the legal purchase age. Digital marketing communication that involves direct interaction with a user should require age affirmation prior to engagement. User-generated content on a site or page controlled by the brand must be monitored and moderated on a regular basis. Digital marketing communications that are intended to be forwarded by users should include instructions that the content shouldn’t be forwarded to individuals below the legal purchase age. Digital marketing communications must respect user privacy. For better understanding, we take a closer look at each of these rules below. Bear in mind that most of the discussion outlined in this article comes from a US perspective, and the rules and regulations around alcohol promotion vary by country. Knowing your audience is the first step to successful communication. 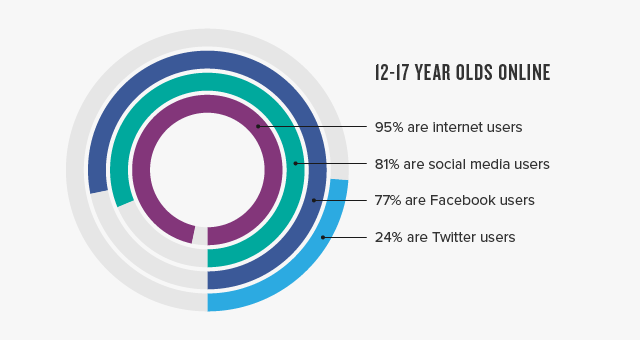 In 2014, 67 percent of Americans aged 12 and older said they use social media. Thus, alcohol brands are highly restricted in this area. While the average business can choose to market anywhere across the social media landscape, alcohol marketers in the US are restricted to platforms where 71.6 percent of the audience is over 21 years of age. This not only limits the platforms alcohol brands can use to reach customers, but it also forces them to diligently research each platform before creating a profile. According to the Pew Internet Project’s 2012 research on teens, 95 percent of 12–17 year olds were online, with 81 percent using some kind of social media. Of those, 77 percent used Facebook, and 24 percent used Twitter. There isn’t a wealth of demographic data around teens specifically, but more recent research shows that Instagram has become very popular among the younger generation. According to eMarketer, 11.4 million of Instagram’s 300 million members are 17 or younger. As of spring 2014, 30 percent of 12–17 year olds favor Instagram, while 27 percent and 23 percent prefer Twitter and Facebook, respectively. One thing to be aware of in your research is how “adult” is defined. For example, Nielsen reported that 71 percent of online adults use Facebook, as of January 2014. However, Nielsen considered anyone over the age of 18 to be an adult, which isn’t much help for alcohol brands in the US. Fortunately, other data from Nielsen has shown that more than 80 percent of audiences on Facebook, Twitter and YouTube are older than 21. Ensuring a 21-plus audience only gives you the right to be on the platform and post updates; it doesn’t permit you to follow people or reply to their comments. This makes for a very one-sided conversation and creates a major barrier for brands looking to engage with current and prospective customers. The only way around this restriction is through age affirmation, which both Facebook and Twitter have. 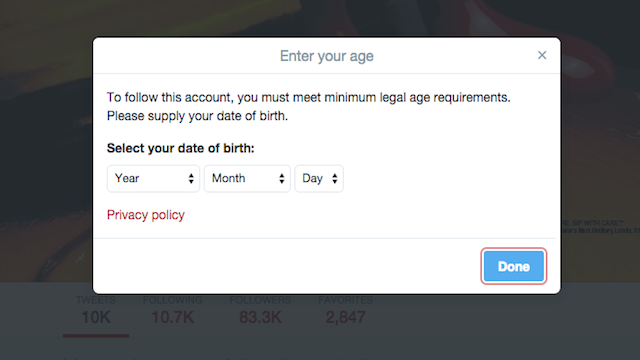 Twitter, for instance, has an age-screening feature that requires people to provide their date of birth in order to follow an alcohol brand. 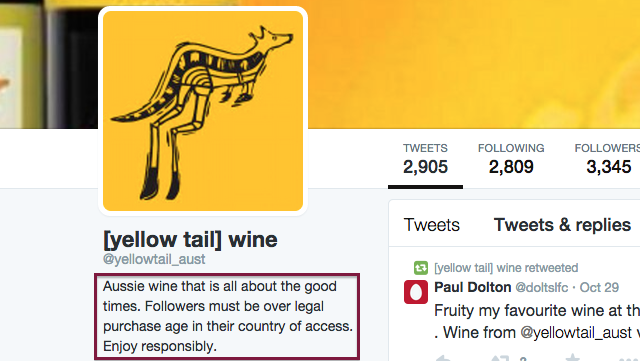 It’s triggered when a user clicks “Follow” on an alcohol brand’s profile and requires a date of birth to be entered. Twitter will check that the age entered matches the legal drinking age for the country associated with the person’s account. Once successfully verified, the person’s follower status will be confirmed, and Twitter will remember that the account met the age requirement so that the person won’t need to go through the age verification process again. If someone’s entry doesn’t meet the legal drinking age in his or her country, that person’s follow request will be denied. 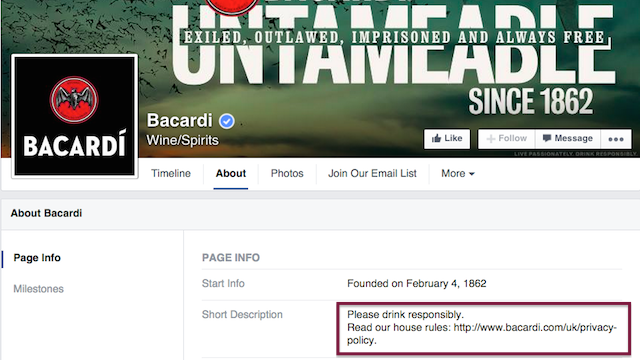 Facebook restricts visitation of alcohol brand Pages, allowing access only to Americans who have previously registered as being 21 or older. Alcohol ads also are displayed only to people who are 21 or older, and underage users are unable to view friends’ Likes of alcohol-related Pages. YouTube offers brands the option to require either date of birth entry or to limit alcohol channel visitation to registered US users who are 21 or older. Regardless of restrictions (and work-arounds), not all platforms make sense for every brand. It’s wise to start with a sound social strategy before launching any new channels. For instance, if your target audience is primarily male, you might have less of an impact on Pinterest, where females dominate the demographic. If two-way dialogue is an important component of your strategy, then being active on Instagram won’t be the best use of your time either. The same with other social networks—if the demographics don’t match up, there’s no sense in trying to force it. mike’s hard lemonade is especially diligent on this front. The brand has experienced much success on Facebook and Twitter, thanks in part to age-gating, but its latest product offering, Palm Breeze, will be entering unchartered waters with the company’s first-ever Instagram ad campaign. Keep in mind that the legal drinking age is different depending on which country you’re in. If you have an international audience, it might be worth creating separate accounts for each country for more accurate targeting. Most marketers are keen on the importance of social listening. It not only makes your engagement more efficient and effective, but it also give you a sense of the general sentiment around your brand, product or competitors. 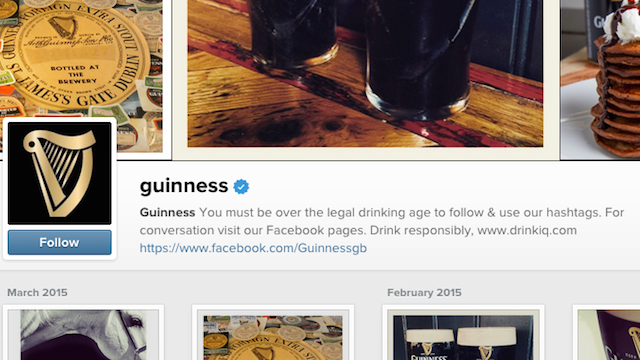 For alcohol brands, however, social listening isn’t just a nice-to-have; it’s a must. In fact, the self-regulatory guidelines state that alcohol brands must police user-generated content that is inappropriate or that promotes irresponsible or underaged drinking. Brands are advised to monitor user-generated content each business day or, at minimum, every five business days. Be sure to remove inappropriate content promptly. Since you can’t remove a Tweet that you didn’t post, this applies mostly to your blog, Facebook Timeline and Instagram comments. Follow these instructions to remove inappropriate comments from your Instagram photos. 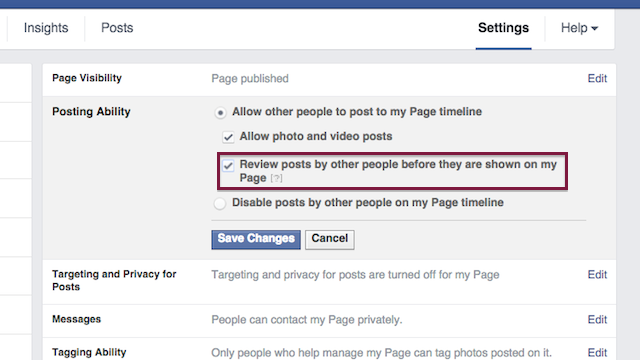 On Facebook, you can minimize the amount of questionable content appearing on your Timeline by adjusting Posting Ability in Settings. Check the second box, and you’ll be able to review every post made by someone other than a Page Admin before anything is displayed on your Timeline. This will make it easier to focus on incoming comments and replies. According to an FTC study, one company reported rejecting about 8 percent of all user-generated content, largely because the posts contained profanity, encouraged excessive consumption or involved unauthorized advertising or spam. Regardless of how you choose to regulate your channels, it’s a good idea to add a clear disclaimer for all your fans to see, stating that any inappropriate content will be removed. It’s also important that you stick to removing inappropriate content, as defined by the guidelines, and don’t make a habit out of removing your own posts or updates. Prior to the collection of any information, the brand will require an individual to affirm that he or she is of legal purchase age, and user information can only be collected from those individuals who are of the legal purchase age. The brand shall employ a mechanism for a person to opt in before receiving a direct digital marketing communication and opt out to discontinue receiving direct communications. Clear information must be provided about collection and use of personal data. Under no circumstances will the information collected be sold or shared with third parties unrelated to the brand. People should be encouraged to read the privacy statement before submitting their information. Measures will be taken to keep user information secure and protected from loss or theft. In addition to the restrictions above, be mindful of a few limitations within each platform. Twitter, for example, limits the bio text field to 160 characters. Many alcohol brands include some sort of “drink responsibly” statement there, leaving little room to say more. Although regulations don’t require that these statements appear in a particular location, it’s strongly recommended that they’re placed where a viewer “would most logically expect to find information about the brand or the company.” Since this is generally the bio section (often governed by character limits), alcohol brands on Twitter and Instagram are at a slight disadvantage. Despite the limitations placed on advertising, alcohol brands have still enjoyed great success on social. Here are a few companies that are making a splash responsibly. Staying closely aligned with Beer Institute guidelines, mike’s recently switched to a full digital marketing strategy. As a result, it hit one million fans on Facebook this past summer, making it the largest flavored malt beverage on social at the time. To celebrate its 1 millionth fan, Paul Siano, mike’s became paul’s hard lemonade for 24 hours. While there isn’t a law preventing people from drinking beer on camera, the Beer Institute’s voluntary guidelines state that beer advertising “should not depict situations where beer is being consumed rapidly, excessively, involuntarily, as part of a drinking game, or as a result of a dare.” That said, several broadcast networks adhere to the outdated Television Code that prohibited showing alcohol being consumed. 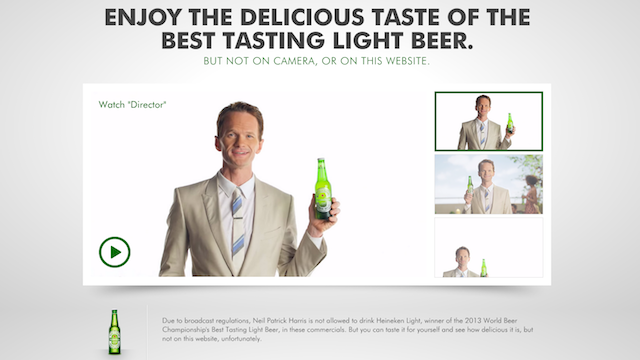 In this video series, the brand teamed up with actor Neil Patrick Harris to bring its “Best Tasting Light Beer” award to life. Harris pines over wanting to take a sip, but due to regulations in the US, is prevented from tasting the product on camera. The tongue-in-cheek, three-video series has more than 7.8 million views on YouTube. Rather than use humor, Budweiser went the emotional route. The brand has become a fan favorite due in part to its 2014 Super Bowl commercial, “Puppy Love,” which featured a heartwarming tale of a puppy and one of the iconic Clydesdale horses. The video has received more than 57.7 million views—more than any other Super Bowl spot that year. Building on that success, Budweiser brought back a puppy for its 2014 PSA against drunk driving and for its 2015 Super Bowl “Lost Dog” ad. The latter has roughly 28 million views, while the former, released in September 2014, lapped up more than 22.5 million views and trended with the hashtag #friendsarewaiting. Even though these commercials might not inspire people to go buy a beer, they build awareness for the brand in a socially responsible way. Contests and giveaways are popular marketing tactics for brands looking to attract new fans and reward loyal customers. Unfortunately, companies regulated by the federal Alcohol and Tobacco Tax and Trade Bureau are prohibited from running contests that use booze as a prize. Whitehall Lane Winery, however, doesn’t let TTB guidelines stop it from growing a community of loyal fans online. With a strong social presence, the winery partners with complementary brands to give away wine glasses and cookbooks as a way to reward fans. The company also celebrates fans by reposting user-generated content on Instagram, Facebook and Twitter. Each re-post includes a shout-out to the original poster. It’s a great way to acknowledge fans, but it also helps visually promote your product without running the risk of violating any rules. The family-owned winery has 1,100 followers on Instagram, 4,954 Likes on Facebook and 5,555 followers on Twitter. As stated, the rules and regulations identified in this article apply mostly to the US. If you’re marketing to a global audience, before you launch your campaign, familiarize yourself with each country’s restrictions. Canada, for instance, has rules against even giving the impression, visually or in sound, that alcohol is being consumed. In Finland, alcohol-branded social media has been banned entirely. Make sure you adapt your social media campaigns accordingly.